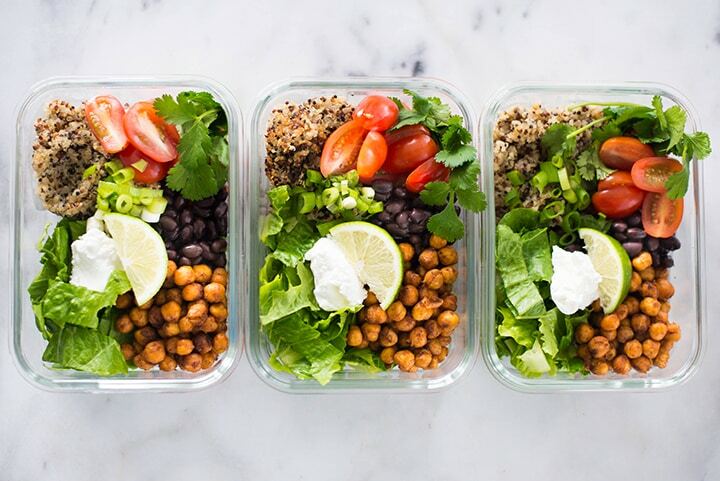 Jump on the Meatless Monday bandwagon with a delicious, filling, nutritious, and satisfying vegetarian and healthy meal prep. With this easy vegetarian dinner or lunch, your day will be stress-free, but yummy, and healthy. I think you all know I’m not vegan or vegetarian. But I enjoy cooking easy vegetarian recipes from time to time. Because they are delicious and full of great nutritious benefits. And because eating less meat has numerous health benefits. So, friends, let’s just discuss this Vegetarian Taco Bowl recipe. 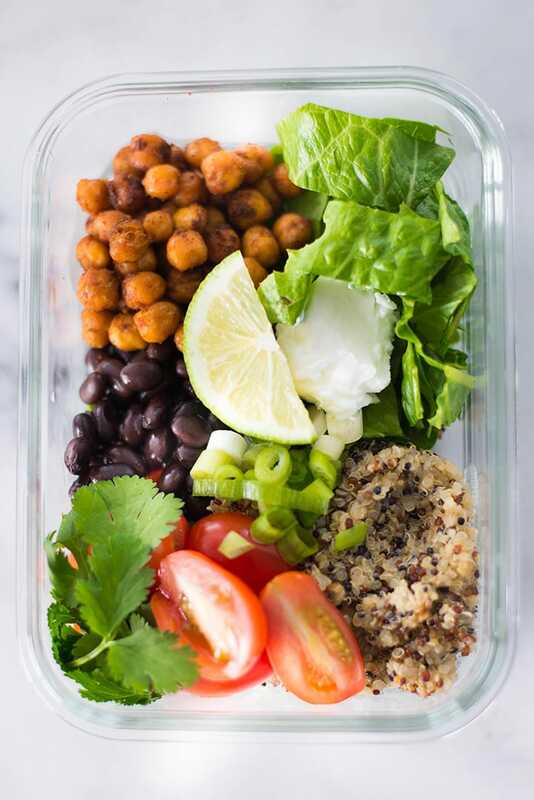 It involves spicy chipotle baked chickpeas, tri-colored quinoa, black beans, fresh veggies, and greens. Plus avocado and greek yogurt toppings. So TASTY! If you were looking for more vegetarian dinner ideas, you’re in the right place. 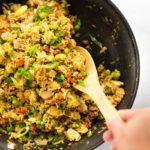 Aside from this easy meal prep, I have tips and substitutions for meat that will help you come up with numerous vegetarian dinner ideas. 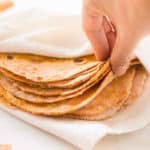 Because the best vegetarian recipes are very simple – all you have to do is to replace your typical meat proteins with vegan and vegetarian proteins. In order to make balanced and healthy vegetarian recipes, you have to make sure all the key nutrients are included. Well, to be fair, that’s pretty much how it goes for all meals, whether they are meatless meals or not. 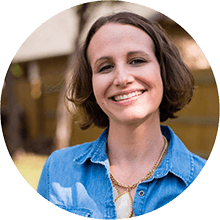 So, if you want to eat more plant-based and to include more vegetarian recipes into your weekly rotation, let’s get started. By the end of this post, you’ll know how to put together a delicious, hearty, and satisfying vegetarian meal prep. And, of course, meal prep ideas for making the most of your vegetarian dinner ideas. and delicious vegetarian toppings, including avocado, greek yogurt, black beans, and grape tomatoes. plus more fresh ingredients for ah-mazing meatless meals. 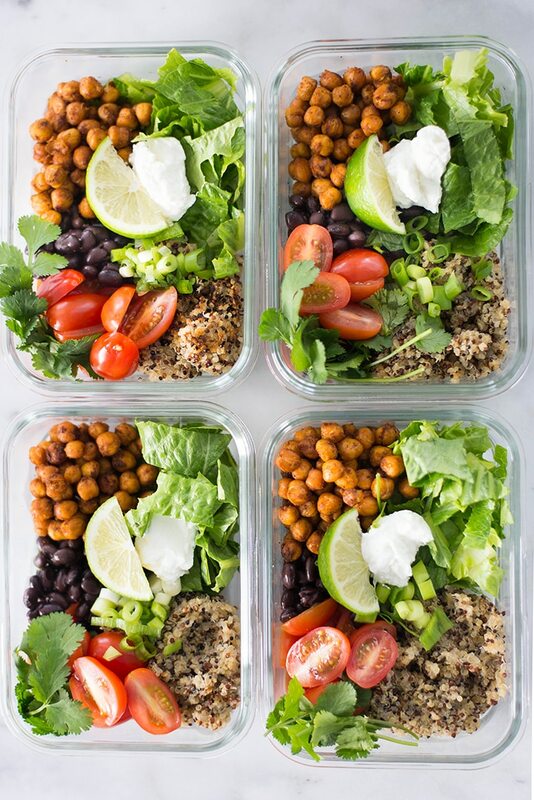 once baked, transfer the chickpeas (divided into portions) to meal prep containers and add the rest of the ingredients. Easy vegetarian dinners for healthy, high in protein, and high in fiber. AKA weeknight dinners are DONE! 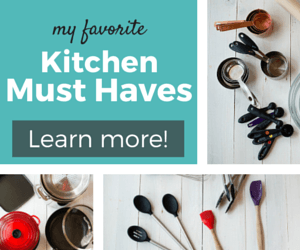 But there’s more… More tips for healthy meal prep and more healthy vegetarian recipes. So keep reading. If you’re wondering why Meatless Mondays became a thing, it’s because there are many health benefits associated with eating less meat. Health benefits like lower cholesterol, lower blood pressure and losing weight easily. A balanced diet doesn’t mean eating animal protein at every single meal. You can have protein-filled meals without meat. 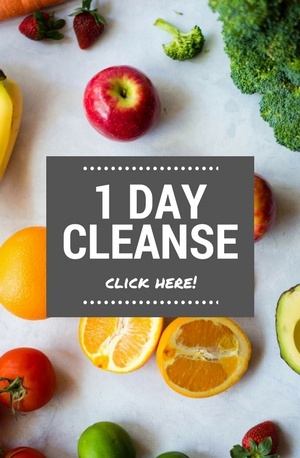 You can do this every other day, once per week or more often during spring and summer when fresh foods that contain lots of veggies and fruits are better than rich and hearty dishes. Ok, fruits and veggies should definitely be on the list for your vegetarian weekly meal prep. But… what else? In my vegetarian meal prep, we have quinoa and chickpeas. However, there are many more plant-based and animal proteins you can use as substitutions for meat. eggplant – versatile and easy to cook, eggplant is a great replacement for meat proteins. You can grill it, bake it or turn it into stir-fry dishes. Either way, it’s yummy. lentils – high in protein and with a hearty texture, lentils are legumes that provide you with many health benefits. And they are great substitutions for meat in recipes that require beef. mushrooms – any type of mushroom will replace meat wonderfully but Portobello mushrooms have a special place in my heart because they have a meaty texture that’s just perfect for burgers. And I HEART burgers. Especially when they are healthy! beans – when it comes to their nutritional profile, beans are similar to lentils. Basically, they are amazing. High in protein, fiber, and nutrients. Everything you want, right? cauliflower – oh, you know how much I love cauliflower. Cauliflower can do so many different things – side dishes, burgers, main dishes. Cauliflower is amazing, friends. So make sure on your list of easy vegetarian recipes there are some cauliflower recipes included. eggs – eggs are a great source of protein and healthy fats. You can boil them and add them to salads or fry them and serve them with cauliflower rice and a veggies salad. greek yogurt – greek yogurt is just amazing. Such a nutritional powerhouse. A yummy one too. You can use greek yogurt to make a healthy dip sauce or you can add it to your morning shake. Or you can make healthy sweet treats like frozen yogurt. cheese – eating cheese in moderation is not bad so you can add cheese into your healthy vegetarian recipes. 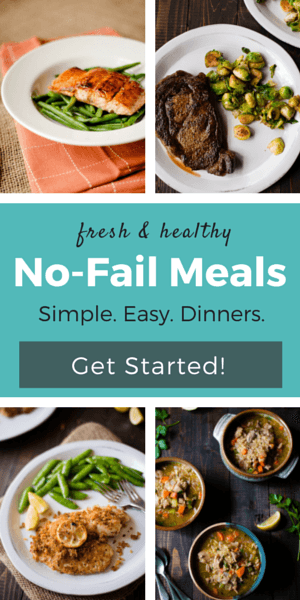 Wanna know the secret of stress-free, easy vegetarian dinners? Meal prep! Seriously, planning ahead is key! It will make healthy eating so much easier. prep your meatless meals and store them in the fridge. Super duper easy! 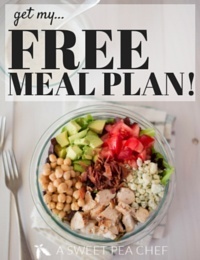 But so useful for staying on track with your meal plan. plastic meal prep containers if you find glass meal prep containers to be too expensive. 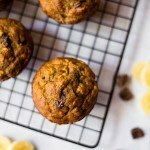 Ready for more healthy vegetarian recipes? Because of course I have more! After all these tips, I just had to include more. In my opinion, these are the best vegetarian recipes – they are quick, easy, and tasty. 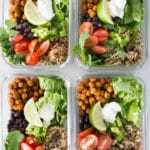 You can use these healthy vegetarian recipes for lunch or light dinner vegetarian meal prep. These Spinach, Egg White and Zucchini Lunch Wraps are just so easy to make. And ready in 15 minutes. And they taste amazing. 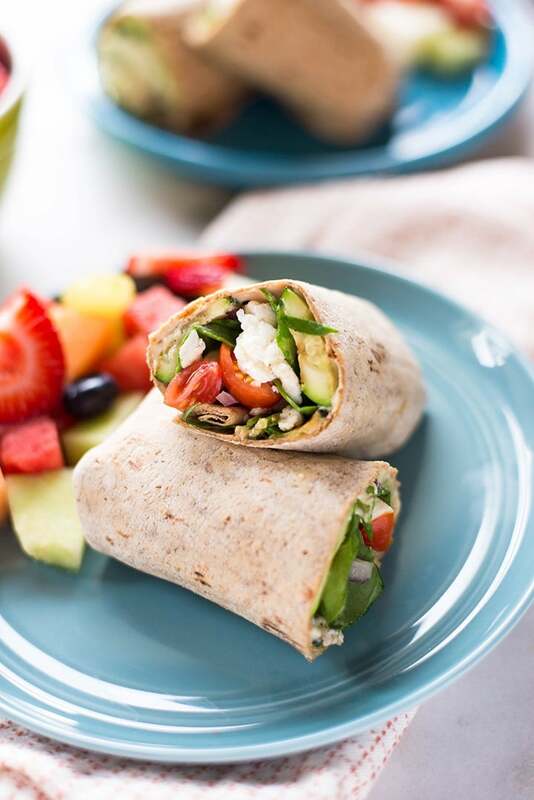 The Spinach, Egg White and Zucchini Lunch Wraps are great for putting together a healthy lunch that is filled with protein and has amazing flavors. But the recipe can be used for vegetarian meal prep too. Get the recipe. Next stop – Quinoa Lentil Salad with Lemon Vinaigrette. Packed with fiber, protein, and nutrients, this salad is perfect for lunch. It works for a light dinner too. 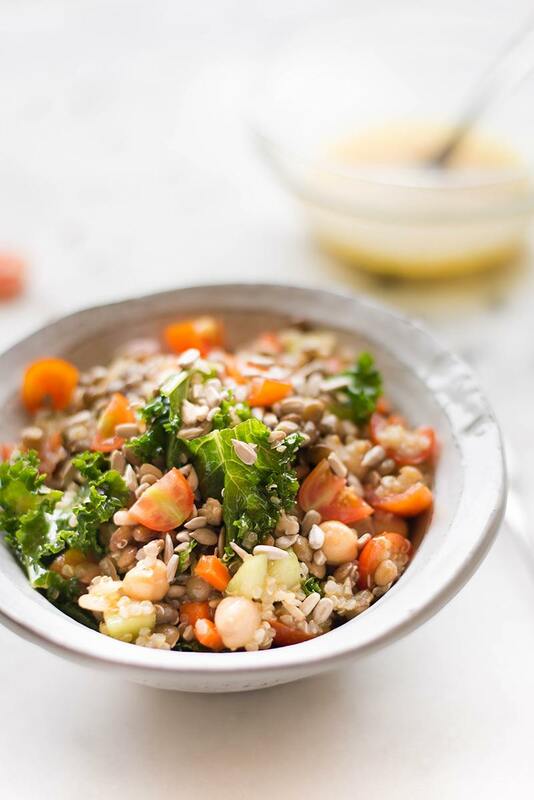 With the Quinoa Lentil Salad with Lemon Vinaigrette, you get amazing flavors and delicious healthy goodness. Get the recipe. 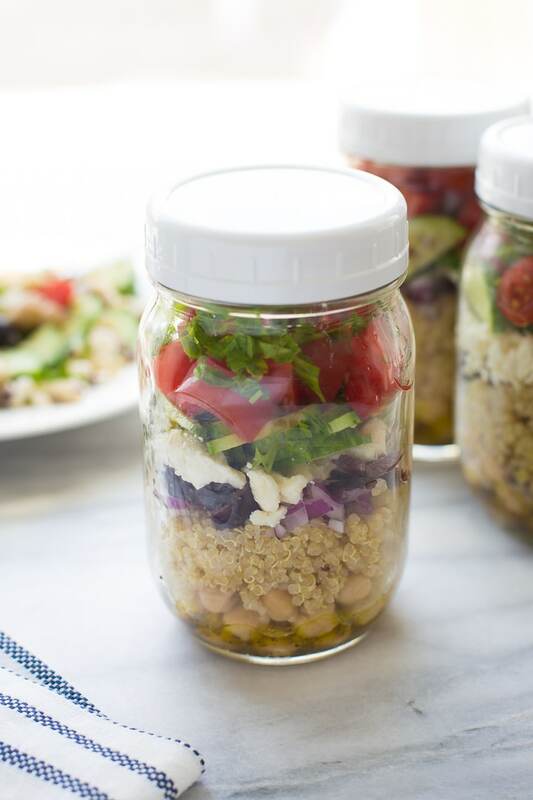 Another great vegetarian meal prep option – Make-Ahead Greek Quinoa Stacks. Ready in 30 minutes and full of fresh flavors and yummy ingredients. The Make-Ahead Greek Quinoa Stacks are perfect for summer months, easy to make, and perfect for taking them on-the-go. Get the recipe. 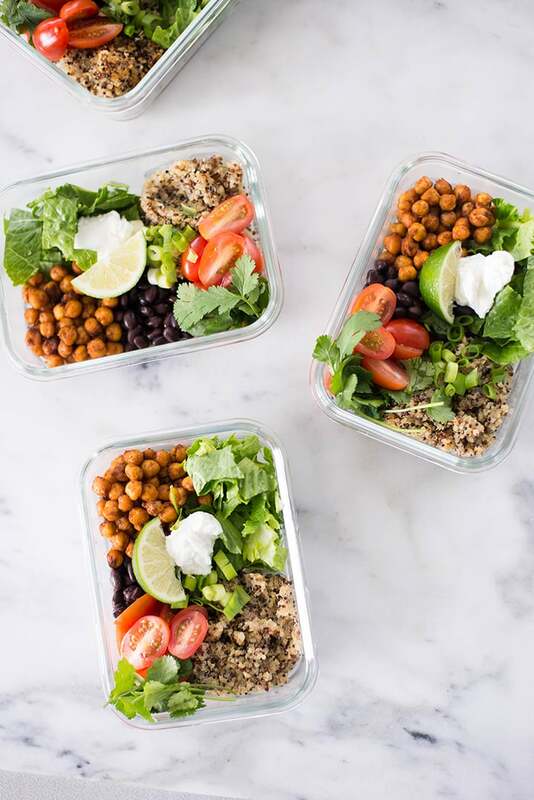 Jump on the Meatless Monday bandwagon with a delicious, filling, nutritious, and satisfying vegetarian and healthy meal prep. With these easy vegetarian dinners, your evenings will be stress-free but yummy, and healthy. Preheat the oven to 350 degrees F and line a rimmed baking sheet with parchment paper. Set aside. 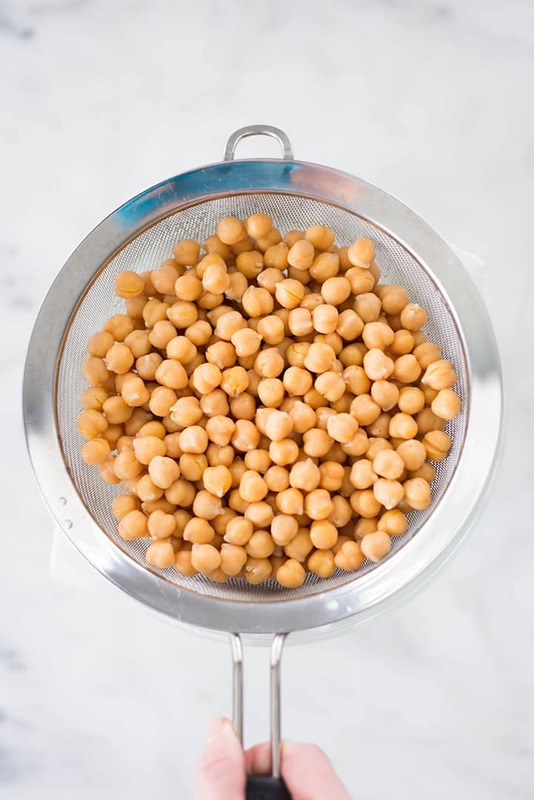 Place the rinsed chickpeas on a clean kitchen towel or a few paper towels and allow them to drain. The dryer, the better. Then, transfer them to a large mixing bowl. Over the chickpeas, add olive oil, chili powder, chipotle chili powder, cumin, sea salt, and garlic powder. 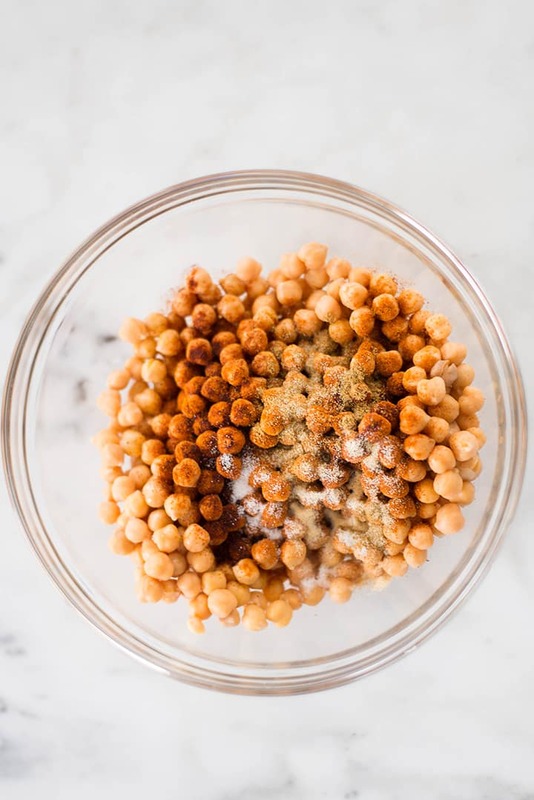 Toss this thoroughly with a spoon to ensure the chickpeas are evenly coated. 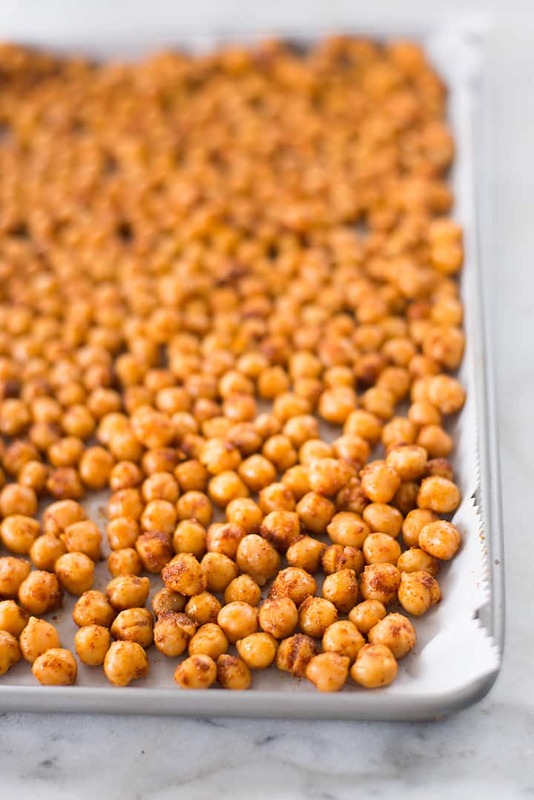 Then, transfer the seasoned chickpeas to the prepared baking sheet in an even layer. Bake the chickpeas for about 20-25 minutes, shaking the pan halfway through baking time, until the chickpeas are heated through and starting to become a little crunchy. Remove the chickpeas from the oven and then allow to cool. While the chickpeas are in the oven, combine uncooked quinoa with sea salt and low sodium vegetable broth in a saucepan, and bring to boil. Simmer, covered, for 20 minutes, until all the water is absorbed. Then, fluff with a fork and set aside to cool. 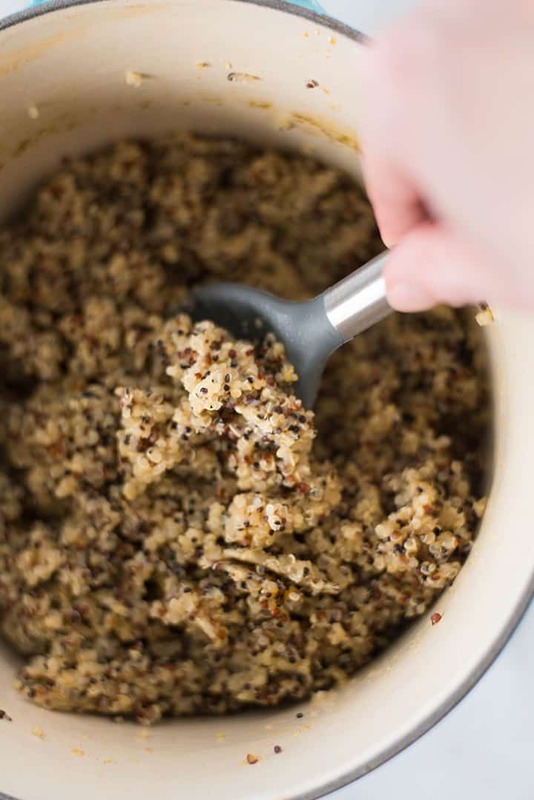 Start off by adding in the cooked quinoa into one quarter of the meal prep containers. Next to the quinoa, add in sliced grape tomatoes, fresh chopped lettuce, spicy and chipotle chickpeas, and rinsed and drained black beans. Seal up the containers and place into the fridge for up to 5 days. Nutrition information includes the avocado and greek yogurt toppings. To make these bowls vegan, replace greek yogurt with non-dairy yogurt or omit. 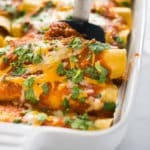 This recipe is easy to make and tastes really good. 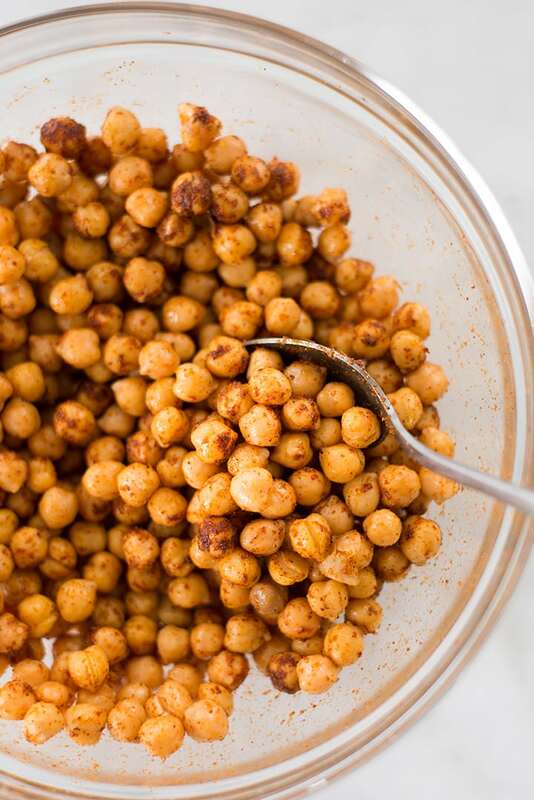 The chipotle chickpeas are really good for snacking too. I made these up for lunches and it was nice to just pull one out and put the toppings on. Quick to put together and very filling. Great recipe.